Frisson - ZineWiki - the history and culture of zines, independent media and the small press. Frisson was a small press publication edited by Scott H. Urban, and published by Skull Job Productions. 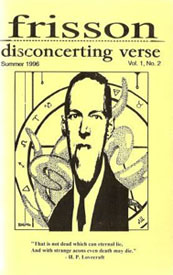 Frisson, subtitled "disconcerting verse", was devoted to dark verse in the horror, macabre, and weird genres. It was published in Wilmington, North Carolina, U.S.A. The first issue was released in 1996, and it ran at least to 2001 (#23 is dated Autumn 2001). Contributors of verse included Mike Allen (Mythic Delirium), Michael Arnzen, Lee Ballentine, Lida Broadhurst, Donna Taylor Burgess (The Blue Lady), Jennifer Crow, Kevin L. Donihe (Bare Bone), Tim Emshwiler, Kendall Evans, Sean Russell Friend (Overspace), W. Paul Ganley (Amanita Brandy), John Grey, G. Durant Haire, K.S. Hardy, Dwight E. Humphries, Charlee Jacob, D.F. Lewis (Nemonymous), Lyn Lifshin, Mark McLaughlin (The Urbanite), Kurt Newton, Michael Pendragon, Tom Piccirilli (Epitaph), John Picinich, Karen R. Porter, Jacie Ragan, Wendy Rathbone, Angel Reign, Jessica Amanda Salmonson (Fantasy Macabre), Michelle Scalise, Ann K. Schwader, Craig Sernotti, Marge B. Simon (Star*Line), Steve Sneyd (Data Dump), Christina Sng, Douglas M. Stokes, Scott H. Urban, and G. Warlock Vance, among others. Artwork was by Allen Koszowski, among others. This page was last modified on 30 July 2016, at 11:32. This page has been accessed 9,930 times.